Imagine yourself walking down a dimly-lit street in twilight, on your way to an auditorium to make a speech. You're minding your own business when, suddenly, a madman runs up and shoots you in the chest from mere feet away! You clutch the wound, seeing the bright pool of blood rapidly staining your white shirt, and collapse to the ground in shock. Terrified, you let your bodyguards carry you into the waiting car and rush you to the hospital. Or at least...this is what most people would do. If you were Theodore Roosevelt, you would stubbornly refuse all offers of help and refuse to go to the hospital. You would instead demand to be taken on to the auditorium to make your speech. You would rip open your coat onstage to show off your blood-stained shirt to the crowd, declaring that "it takes more than that to kill a bull moose!" You would announce that you would be speaking for 60 minutes, but instead go on to speak for 80. Only after that would you allow yourself to be taken to the hospital for surgery. You would carry that bullet in your ribs for the rest of your life, and every time a press camera flashed near you, you would proclaim, "Ah, shot again!" But then, there was only one Theodore Roosevelt. And he was amazing. 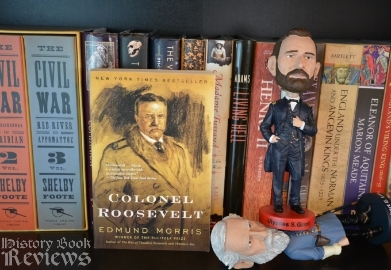 Colonel Roosevelt is the third and last book in the three-part biography of Theodore Roosevelt by Edmund Morris. This book covers the last ten years of Theodore's life, after the end of his presidency in 1909 to his death in 1919. To my mind it also recovers the magic, the delight, and the eccentricity of the first book in the series, The Rise of Theodore Roosevelt. The insight into Theodore's mind and soul are the most fascinating parts of any biography on the man, and Edmund Morris delivers this in full force in Colonel Roosevelt, capturing the final years of the brilliant, ridiculous, complicated, and absurdly hilarious man who was our 26th President of the United States. 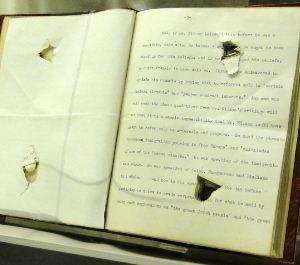 This is Theodore Roosevelt's speech, which was in his breast pocket at the time he was shot, and lessened the impact of the bullet. Notice how many pages it is...his long-windedness probably saved his life here! Roosevelt was the kind of man who did whatever he wanted and didn't care what anyone else thought. He went to Egypt to make a speech shortly after the assassination of the Prime Minister, Boutros Ghali. While there, he received many threats warning that if he mentioned or condemned the assassination in his speech, he would get the same fate. Naturally, he specifically changed his speech to include discussion of the assassination. He hung out in Europe with Kaiser Wilhelm, that old loon, who gave Roosevelt several photos of the two of them during his visit, which he captioned with his own hand. Later, someone came to ask for the photos back, fearing publication, but Roosevelt refused. He also acted as the official US representative at King Edward VII's funeral in England, and had several hilarious and bizarre encounters with an overly sensitive French minister of foreign affairs. He was also invited to meet with the Pope in Rome, under the conditions that he have no contact with the growing Methodist population in the city. Roosevelt replied that he would be delighted to meet the Pope, but that he refused to submit to anyone telling him who he could and could not meet. He was ungoverned by anyone but his own self, and that makes me admire him greatly. The Baby Parade of 1912. This is so incredible I cannot believe it was real. It was literally a parade of babies, each dressed as a tiny Theodore Roosevelt or a tiny William Howard Taft, riding on floats. Unfortunately the parade got rained out, and "a plump competitor dressed as President Taft had his silk hat and frock coat ruined, while Baby Roosevelt cried so loudly he had to be rescued and comforted." How I wish I could see pictures of this!!! The public coined a new phrase: 'TRnadoes', presumably to describe Roosevelt's actions. It just made me envision a spin-off to Sharknado that would break the box office. Theodore went on an expedition to South America to map uncharted rivers, where he contracted malaria and left behind a river named after himself. He returned haggard, 55 pounds lighter, fevered, abscessed, and malnourished. When asked why on earth he had subjected himself to such a dangerous undertaking, he responded "It was my last chance to be a boy." He doted on his first granddaughter, saying that his "heart is like water before her." He was falsely accused in print so many times of drunkenness that he sued, and went to court to prove his sobriety! After testimony from various doctors and manservants, he won his case. The end of the book focuses heavily on the outset of WWI, and the initial neutrality declared by President Wilson. TR was disgusted by this and fought against it with all his being, knowing before most other Americans that they would inevitably have to get involved in the conflict. When the US finally did enter the war, all Roosevelt wanted was to go to Europe to fight, but Wilson's administration wouldn't let him, despite the fact that all his sons went. The end of the book is heartfelt and heartbreaking, and gets really sad by the end. He lost a son in the war, was progressively suffering from ill health and was hospitalized several times. At one point Edith even sent him to a fat camp. He got rather depressed and finally died at age 60, in 1919. He was buried overlooking his beloved Oyster Bay, and at his funeral ex-president Taft was left alone, crying at his grave. Theodore Roosevelt was an exceptionally unique and special person, full of vitality and vigor, humor and passion, and love for his family. He was completely his own person, and Edmund Morris brilliantly shows, rather than tells, the reader how he brightened the world with his personality. He certainly brightened my life by entering it, if only in literary form. Part of what I admire so much about Theodore Roosevelt was that he was passionately against political correctness, an issue very much in the forefront of our own times. At one point he mused "I feel somewhat as if we were all threatened with death by drowning in an ocean of weak tea with too much milk and sugar." He was an intellectual (on at least one occasion he quoted from cuneiform script), a humorist, and an adventurer, never shying away from personal danger. His wife, Edith, was even moved to chastise him once, saying "Theodore, I wish you'd do your bleeding in the bathroom. You're spoiling every rug in the house." Basically, he was just awesome. And I love him.